Yesterday, Apple announced its long-rumored tablet computer, the iPad. This is not first tablet computer; there have been many devices that could fall into that category released over the years. But all of them, including the HP ‘slate PC’ hurriedly rushed to the stage by Microsoft’s Steve Ballmer at CES a few weeks ago, have suffered from the same limitations. These limitations are due in large part to the fact that these tablet computers have been based on PC operating systems. Mac and Windows apps are not designed to be used with a touch-screen; so instead of offering something new and better, tablet PCs have offered something worse—ungainly hybrids that didn’t work as well as the PCs upon which they were based. Apple took a completely new approach to the tablet computer, and has made obsolete all that came before. Unlike earlier tablet computers, the iPad does not run a PC OS like Windows or Mac OS X. Instead, the iPad runs a new version of the iPhone OS, an operating system built from the ground up with touch as the primary interface. There is no pointer or cursor; your fingers are the pointers. There are no command key shortcuts; instead, multi-touch gestures provide the vocabulary of human-computer interaction. Apple is the only significant computer manufacturer that controls the whole widget: the battery, the CPU, the OS, and the core applications—Apple does it all. The results speak for themselves. Watch the iPad video or if you have a bit more time, the video from yesterday’s special event. Microsoft, Amazon, and others will have to work hard to match what Apple has accomplished with the iPad. I’m convinced that the iPad will shortly become the first popular tablet computer. It will define new standards for touch-based interfaces that will be aped by Microsoft and other imitators. The iPad is not without problems. There’s no way to add more memory; the 3G version cannot be used as a phone; there is no camera; and the pixel density is anemic for a device meant to be used up close. But these are minor nitpicks. Some of these features were no doubt left out intentionally due to cost or time constraints. Apple doesn’t include a feature until it can be done well. It’s certain that future version of the iPad will address some of the more obvious gaps. I’m excited about the iPad and look forward to playing with one at the Apple Store on Bahnhofstrasse in a few months. Will I buy one? That remains to be seen. Ultimately, my decision will be based on whether I determine that the device provides a compelling capability that I don't already get from my iPhone 3GS and MacBook Pro. So... are they giggling about the name in Switzerland? I can’t wait for version two, the iPad Maxi. Yeah, an Android-based tablet could become a real competitor to the iPad—but only if Google applies the same seriousness to consumer hardware that they apply to their other endeavors. 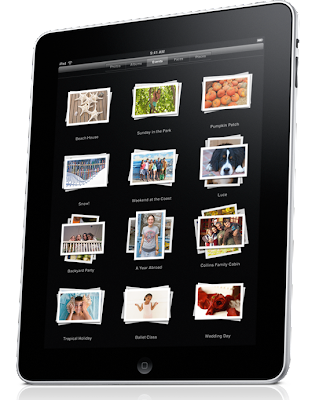 I’m in favor of competition, and would like to see an open alternative to Apple’s closed iPad.